The Brooklyn Townhouse is a single family brownstone located in Park Slope, Brooklyn. Original finishes were selectively retained on all floors except the Garden Level where the most extensive renovations were completed. Doors opening to the garden were inserted where there had been only windows. All sheetrock ceiling and plaster walls were removed to expose original wood joists at the ceiling and brick along the party wall. A custom, solid teak kitchen with teak butcher block counters was installed in the center with open dining at the garden side and the den at the street side. An efficient, wood-burning fireplace is located at the dining area surrounded by hand-crafted Heath tile and space for wood storage below. 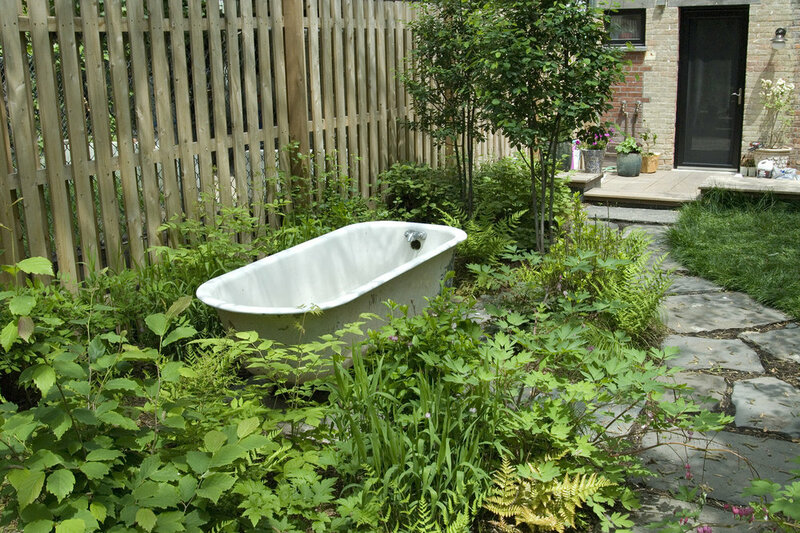 A wide-plank, ipe deck was installed a few steps below the newly-landscaped garden where the original claw foot tub was installed for outdoor bathing. The remainder of the house was completely renovated with two renovated bathrooms, sanded and stained floors and a new walk-in master closet. Central A/C and a high efficiency heating system were installed throughout the house.